Casa do Tanque is a unique holiday home located on a private property of 30 ha, with two other holiday homes. 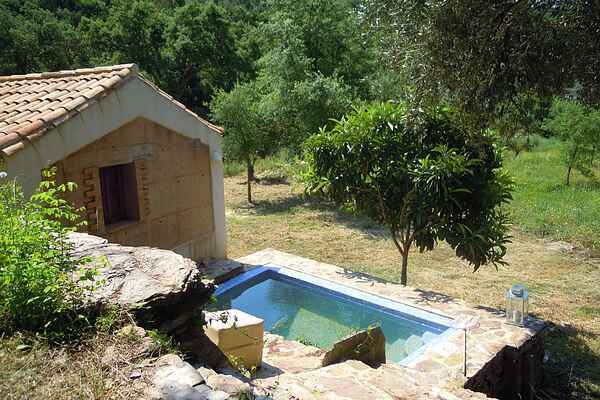 It is situated near the small village of Troviscais (1.5 km) on the west coast of the Alentejo region. The holiday home, an ancient wine cellar, was recently rebuilt and is now equipped with state-of-the-art appliances. The living room and bedroom are inter-connected by a wider door. The living room grants access to two open air patios from which you may enjoy a wonderful sight of the countryside. This unique property is situated in the "Vicentine Coast National Park". Close to the holiday house there is a small tank which used to function as a water reservoir and is nowadays utilized as a recreational tank (2,5 x 2,5 m, 0.90 depth), where you can refresh from the hot summer sun. The garden invites you to relax in the shadows of its trees. The property is perfectly suited for a carefree holiday in the Alentejo; you can find absolute silence here. The holiday home is located in a rural surroundings being approximately 8 km from S. Luís, the nearest village, 15 km from Odemira, and 22 km from Vila Nova de Milfontes, a popular tourist destination next to the sea. One of the main advantages of this holiday house is its location and the activities on offer in the surroundings. Activities like bird watching, horseback riding, canoeing or swimming are popular. Bicycles, badminton rackets and binoculars for bird watching are to your disposal. The nearby "Costa Vicentina"(20 min) offers some of the most beautiful beaches in Portugal. Only 15 min. walking distance from your holiday house is the river Mira which is recognized as one of the cleanest rivers in Europe and invites you for a refreshing swim.